Three Thousand Hooded Cranes Pass by Jeju, Korea in March 2008. Jeju Wildlife Research Centre, Inc. This is a summary of monitoring three thousand hooded cranes Grus monacha who passed by South Korea March 21~25, 2008. (1) A group of 2,920 hooded cranes were flying over Jeju Island, South Korea in the afternoon of Friday March 21, 2008. They did not take a rest in any parts of South Korea. B group of 200 hooded cranes were flying over Goorye County, Jeonnam province at 15:40 and another group of 242 hooded cranes were flying over the same place at 16:10 of March 22, 2008. But it seems that B group is not a part of A group. If A group continued flying over the night of March 21, they would be out of Korea in the afternoon of March 22. But, only one individual was found at Han River Estuary and Cheorwan area on March 22 and 23 by Dr. Lee Ki Seop. (2) C Group of 410 hooded cranes landed on Jeju in the evening of March 21, spent the night there, and left Jeju at 7 A.M. of March 22, 2008. The same (deemed) group was flying over Heuksanddo Island, southwest edge of South Korea at 10 A.M. of March 22, 2008. The same(deemed) group landed on Cheonsuman Bay of Seosan city, west seashore of South Korea before 4 P.M. March 22. The same group is still remaining there until now (9 P.M. of March 25, 2008). The flying speed of C group is calculated as 800 meter per minute (48 kilo meter per hour). (5) D group of 27 hooded cranes was observed taking a rest in Nakdong river estuary, southeast seashore of South Korea from 3:30P.M. until 5P.M., March 23, 2008. (6) E group of 200 hooded cranes took a rest in Cheonsuman Bay of Seosan city, west seashore of South Korea from March 16 until March 24, 2008. (7) F group of 100 hooded cranes left Suncheon Bay, southern seashore of South Korea in the afternoon of March 23, 2008. (10) G group of 61 hooded cranes was taking a rest with 350 white-naped cranes in the Estuary of Imjin river, near DMZ in the morning of March 25. (11) H group of 300 hooded cranes was found at 1 P.M. of March 25 in Gangwhado Island. (1) In Jeju Island, 15 members and helpers of Jeju Wildlife Research Center took part in counting the number of hooded cranes on March 21 and 22, 2008. They went every important parts of Jeju Island, which is 80 km east/west and 40km north/south long. The participants are: Kang Chang Wan, Kim Eun Mi, Kim Young Ho, Kang Hee Man, Ji Nam Joon, Kang Young Sik, Kim Young Ha, Park Young Kwon, Jang Soo Bang, Kim nam Gyu, Oh Eun Jeong, Kim Ho Cheon, and four other massmedia reporters. (2) In mainland Korea, the following persons and organizations took part in monitoring the movement of hooded cranes from March 21 until March 25. 2) Mr. Kim Jooheon and Mr. Kim Shinhwan, Korean Wild Birds Society: Cheoncuman Bay of Seosan City. 3) Dr. Lee Ki Seop, Green Wetland Education Center collected data from observers in Ganghwa Island, Goorye county, Haepyung Wetland in Gumi city, Han River Estuary, and Suncheon Bay. 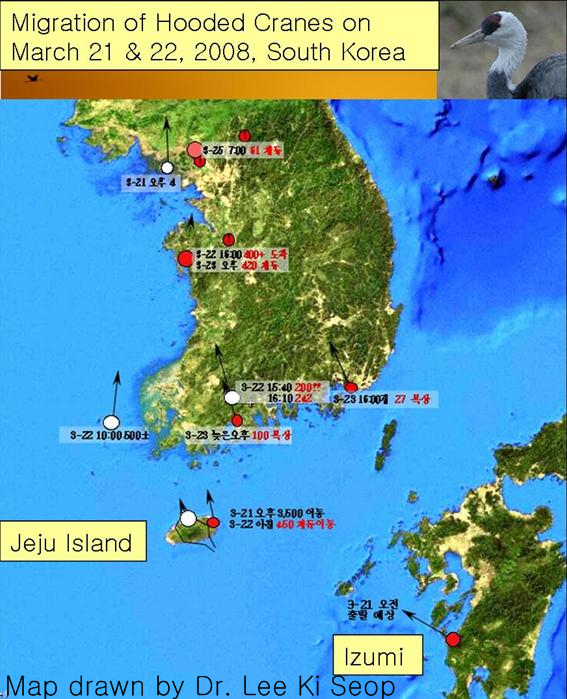 And he monitored Han River Estuary and Cheorwon Area on March 22 and 23 himself. 4) Mr. Park Joong Rok and Mr. Lee In Sik, Wetlands and Birds Korea: Nakdong River Estuary. 5) Mr. Choi Jong Soo, Korean Society to Protect Birds: Joonam Reservoir in Changwon city. 7) Mr. Park Keon Seok of Korean Wild Birds Society: Ganghwa Island and Imjin River Estuary. (1) Every Automn, about 4,000~5000 thousand hooded cranes take a rest in Haepyung Wetland in Gumi city. But they are not seen in the Haepyung Wetland during the spring migratory season. (2) On March 19, 2007, 230 hooded cranes took a rest in Jeju Island for several hours. (3) Several hundreds hooded cranes spend every winter in Suncheon Bay, a Ramsa Site. (4) Hooded cranes are regularly seen in other parts of South Korea during the migratory season. DMZ, Han River Estuary, Gangwha Island, Nakdong River Estuary, Cheonsuman Bay of Seosan City are some of the them. (1) Why did A group of cranes give up taking a rest in Jeju or other parts of South Korea? (2) Why such big group of cranes was observed in Jeju island for the first time? According to the local birdwatchers who have been watching birds in Jeju Island, it is the first time for the last 10 years. (3) What does it mean that C group of 410 hooded cranes spent longer than 4 days in Seosan city? (4) Why do the hooded cranes use Haepyung Wetland only in the autumn migratory season, not in the spring? 6. Pictures, video, and news report. Please refer to the following website page for reference of the migration.